I also like being productive, and sitting still is amazingly productive. You can actually accomplish a lot by doing nothing. As a writer, moments of solitude allow my mind to wonder, think and puzzle my way through whatever project I’m working on at the time. When it’s just me, the silence and maybe a steaming cup of mint tea, I’m able to come up with blog ideas, poetry lines, and sometimes whole book chapters. Many times, during those quiet moments while sitting there turning thoughts over in my head, I’ve come up with a solution to a problem and then marveled at how easy, if not obvious the answer was all along. All I had to do was take a moment and think about it. On one such occasion silence prompted me to remember a business card I’d tucked away after some networking event. I retrieved the card and sent that person a quick email, which then led to a reconnection and business opportunity. You just never know. Solitude is a writer’s friend and silence a creatives soul’s endless aquifer, fertile ground from which great works spring. Think about the great artists of our time, or before our time, since antiquity really. The Rembrandts, the Picassos and Puccinis, the Edisons, Wrights and Warhols, any one of a myriad of creative geniuses who more than likely all shared this one commonality: they created masterful work while working alone. Even Jesus Christ spent time alone praying in the Garden of Gethsemane. Someone once said that if prayer is talking to God, meditation is listening to what He says. I would agree. It’s during the still quiet moments of our life, when we clear away the verbal clutter and noise, when it’s just us alone in a comfortable space, it’s during those moments I believe we can hear God speak. Wasn’t Moses alone on Mount Sinai when God gave him the Ten Commandments? 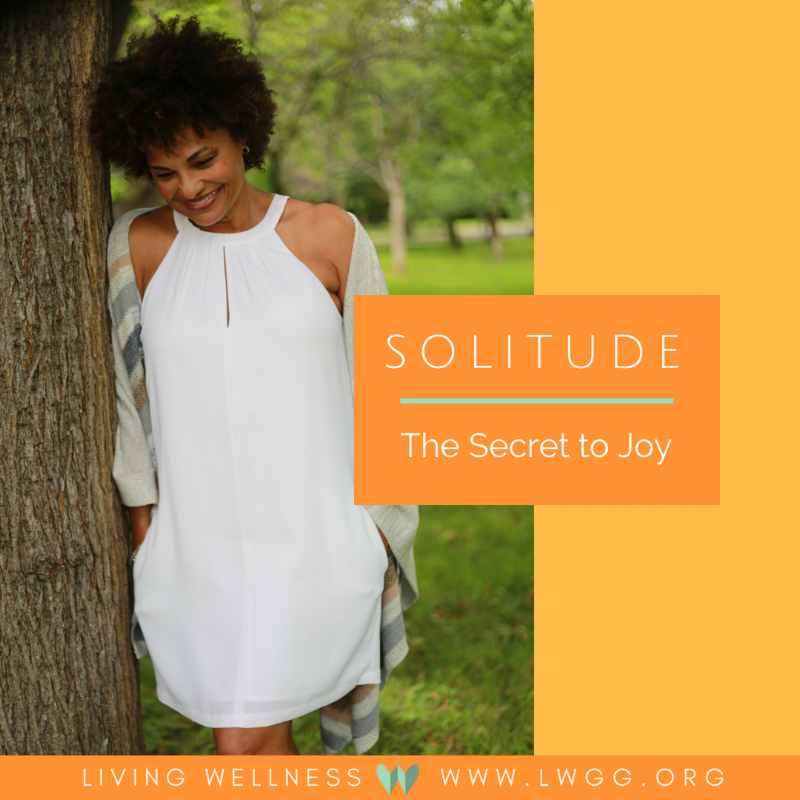 Moments of intentional solitude present an opportunity to open ourselves up to deep conscious thought and bring to the surface the subconscious wisdom that lies just beneath. I find that solitude is a precursor to solace and solace—defined as comfort during times of distress--is evidentiary of peace, the kind of peace that brings joy. The kind of peace that surpasses all understanding. In my recent interview on Living Wellness LIVE, hosts Ashley Darkenwald and Christina Zaczkowski both pointed about my ability to identify and focus on what was most important to me while I was raising my son as a young divorced single mom many years ago. In retrospect, being able to find a few moments here and there just for myself, even back then, is what I believe helped me define what was most important to me during one of the most difficult times of my life. Here’s one final thought; I mentioned at the beginning of this blog post that I sometimes think of myself as a social butterfly. But not just because I enjoy getting out and about, but also because I believe the monarch butterfly provides a great analogy for the importance of solitude. You see, the monarch can only flit about after it has first spent time encased in a pupa, ensconced in solitude, where it transforms from what it was, a caterpillar, into what it was destined to be; an ethereal winged creature capable of soaring high above the earth. But she must first spend time alone. Then and only then can she truly fly, joining a kaleidoscope of butterflies (that’s what they call a group of monarchs). So next time you see me online flitting about from one soiree to the next, know that this social butterfly, much like the monarch, finds the courage to face the world by first finding the courage to face herself, alone. Roxane Battle is a Minneapolis media personality and award-winning author best known for her work as former co-host of the KARE-11 (NBC) Today show. Her memoir, Pockets of Joy, Deciding to Be Happy, Choosing to Be Free became an Amazon bestseller in multiple categories. Roxane works as a creative consultant and frequently speaks on the topic of mindfulness and joy. Follow her on Instagram, Facebook and Twitter @roxanebattle and online at www.roxanebattle.com.